Completely renovated 1 bedroom suite in restored character 8-plex located right at the Rockland/Oak Bay border. 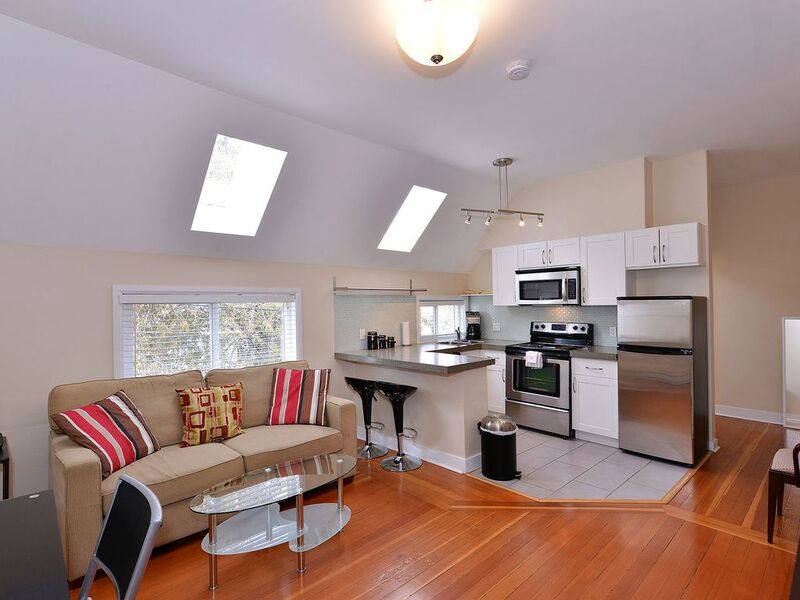 This 1 bedroom suite has just been completely renovated in May 2012. Everything was newly redone, including a brand new kitchen with new shaker cabinets, eat-in peninsula, polished concrete counters, stainless steel appliances, plus dishwasher. The bathroom is redone with new tiles, new vanity, granite countertop and glass door shower stall. The hardwood floors are all newly refinished. The suite comes fully equipped with brand new furniture, appliances’ and everything else you need to enjoy your stay in Victoria. The living room has a sofa-bed, electric fireplace, 40” plasma TV with digital cable and DVD player. The kitchen comes with all cookware, plates and cutlery. The bedroom has a matching queen size bed set with dresser and side table. Fresh towels, linens and wireless internet are all included as well.